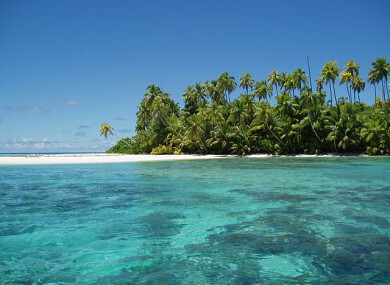 The Chagos Archipelago is made up of more than 60 individual tropical islands. BRITAIN SHOULD GIVE up control of the Chagos Islands in the Indian Ocean “as rapidly as possible”, the UN’s top court has said, in a decades-old row with Mauritius over an archipelago that is home to a huge US airbase. The International Court of Justice said in a legal opinion that Britain had illegally split the islands from Mauritius before independence in 1968, after which the entire population of islanders was evicted. Mauritius and the exiled Chagossians reacted with delight to the opinion delivered by judges in The Hague, which is non-binding but will carry heavy symbolic and political weight. Mauritius Prime Minister Pravind Jugnauth hailed a ” historic moment for Mauritius and all its people”. “Our territorial integrity will now be made complete, and when that occurs, the Chagossians and their descendants will finally be able to return home,” he said in a statement. Britain however defended its hold on the islands, saying the Diego Garcia military base, which has been used to bomb Iraq and Afghanistan, protected people around the world. “The United Kingdom’s continued administration of the Chagos Archipelago constitutes a wrongful act,” chief judge Abdulqawi Ahmed Yusuf said. The United Kingdom is under an obligation to bring an end to its administration of the Chagos Archipelago as rapidly as possible, thereby allowing Mauritius to complete the decolonisation of its territory. The UN General Assembly in 2017 adopted a resolution presented by Mauritius and backed by African countries asking the ICJ to offer legal advice on the island chain’s fate and the legality of the deportations. Colonial power Britain split off the islands from Mauritius — which lies around 1,200 2,000 kilometres away — three years before Port Louis gained independence in 1968. It also paid Mauritius three million pounds. Between 1968 and 1973 around 2,000 Chagos islanders were evicted, to Britain, Mauritius and the Seychelles, to make way for a military base on Diego Garcia, the largest of the islands. The evictions were described in a British diplomatic cable at the time as the removal of “some few Tarzans and Man Fridays”. Diego Garcia is now under lease to the United States and played a key strategic role in the Cold War before being used as a staging ground for US bombing campaigns against Afghanistan and Iraq in the 2000s. Olivier Bancoult, chairman of the Mauritius-based Chagos Refugees Group, told reporters outside court that he was “so happy”. “It is a big victory against an injustice done by the British government for many years. We people have been suffering for many years — I am so lucky today,” he said. The ICJ opinion comes as a stunning blow to London in a case that goes to the heart of historic issues of decolonisation and current questions about Britain’s place in the world as it prepares to leave the European Union. Mauritius’ lawyer Philippe Sands said there was “no wiggle room” in the judges’ view and that Britain would resist pressure to comply. “I suspect the United Kingdom will say to itself, what resistance can we put up to moving forward — and particularly in the context of Brexit, as the United Kingdom finds itself a little bit isolated in the world,” he told reporters outside court. Britain’s foreign ministry rejected the court’s opinion. “The defence facilities on the British Indian Ocean Territory help to protect people here in Britain and around the world from terrorist threats, organised crime and piracy,” the Foreign and Commonwealth Office said in a statement. A US official said Washington saw the case as “purely a bilateral dispute” between Britain and Mauritius. But he questioned the authority of the court, saying that issues should be resolved through negotiations between governments. “It is inappropriate to seek to use the court’s advisory function to settle disputes between states,” the State Department official said in Washington. When judges heard the case in September, Mauritius argued that it was illegal for Britain to have broken up its territory while it was still the colonial power. The Chagos Islanders have already taken their battle through the courts in Britain, where their supporters included the current Labour opposition leader, Jeremy Corbyn. The legal opinion is only the 28th since the ICJ was set up in 1946 in the wake of World War II to provide a tribunal to resolve disputes between UN member states. Previously such opinions include one on Israel’s West Bank barrier in 2004, which judges said was illegal, and declaring legal Kosovo’s declaration of independence in 2010. Email “Britain should give up control of Chagos Islands 'as rapidly as possible' - UN court”. Feedback on “Britain should give up control of Chagos Islands 'as rapidly as possible' - UN court”.